Rivet wins the Racing Post Trophy! Andrea Atzeni won the Racing Post Trophy for the fourth successive year, this time on William Haggas' Rivet. Winner of the Champagne Stakes at the track last month, he was unsuited by the undulations at Newmarket in the Dewhurst Stakes but was much more at home back on Town Moor. The youngster looked to be doing too much in front but he fended off challengers one by one. Aidan O'Brien's Yucatan was hard at work some way out before staying on to take second, a length and three-quarters away, with Salouen placed yet again at the highest level. Atzeni said: "We changed tactics and I just let him stride on and enjoy it. "It would have taken a good one to get by him. "He's very genuine and he stays well. He's a lovely, big, scopey horse. 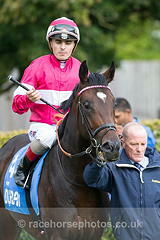 "Fair play to the team for running him as he was a little disappointing in the Dewhurst. "He'll definitely go on (next season)." Available at 11-2 overnight, Rivet was returned the 11-4 second favourite. Along with John Magnier, one of the winning owners is Lester Piggott, whose daughter Maureen is married to Haggas. She said: "It didn't go right for him last time as he was a bit keen and we were in behind. "We were sort of beholden to someone else's pace, so William said if there wasn't the pace we wanted to do our own thing - Andrea did it brilliantly. "The main thing was to get him to relax, which he did perfectly. He looked to be really enjoying it. "He's got the right way about him. All the horses we've had out of the mare (Starship) have had very good minds and he's the same, very laid-back. "He never overdoes it at home so you can run them. He's taking his racing well, looks well and the ground wasn't bottomless. "I think we'll start off at a mile next year but he didn't enjoy Newmarket much. "It will be up to William and the owners, so we could avoid Newmarket and look at France or Ireland. "He's won a Group One and a Group Two. My father bred him with Mr Magnier so it's very special." Rivet was cut to 16-1 from 25s for next year's Qipco 2000 Guineas at Newmarket, but Haggas had a warning for ante-post punters. She said: "I think we'll start off at a mile next year but he didn't enjoy Newmarket much. Sky Bet also cut Rivet to 20-1 from 25s for the Investec Derby.